I suppose my outfit for today is a continuation of my last post which featured my "Photo Floral" skirt styled for fall. This post is sort of a "floral for fall part deux" if you will. I am really trying to work the floral angle these days and mix some of my spring pieces into my fall wardrobe as much as possible before they start to look too "ridiculous". I kind of feel like a broken record talking about the seasons, the weather, and trying to figure out how to transition, given the "bi-polar" weather we have here that rapidly switches from cool to scorching hot in the blink of an eye, so, here are my "brief" two cents about what I am wearing today. Unlike my "Photo Floral" skirt which I wore repeatedly last summer/spring, this is the first time my watercolor floral jacket from Zara has seen the light of day. It was purchased over the summer on clearance ($39.99) when it was just too hot to justify wearing it. For fall, it makes a great piece to throw on over a button down and a wool skirt like a did today. Did I mention that I am super psyched to be wearing a wool skirt, finally? Well, I'll just end on that note! Bag: J. 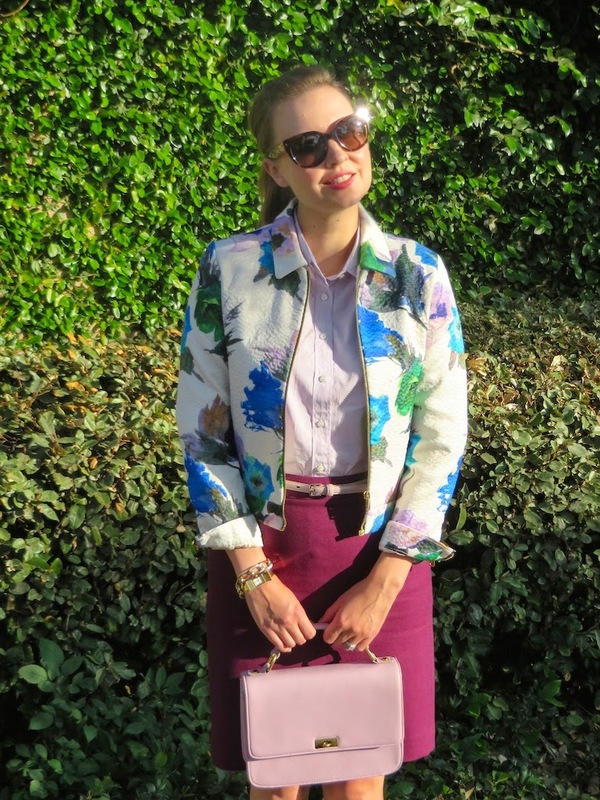 Crew Edie in "Hyacinth"
beautiful jacket i really like how you combined pastels with burgundy! Thanks Irene! I thought the burgundy would give it more of a fall feel. Well, we must have the same idea in mind because I am also doing a denim jacket and I paired it with a floral sheath I think you'd love. Looking your beautiful self, Katie. Have a great weekend, Babe! <3 Ada. Denim and floral is also another fabulous combo for fall! I hope you had a great weekend too, Ada! I love the print and pastel colors of your jacket! It looks great paired with the burgundy skirt! Thanks Jill! I don't usually mix pastels with darker colors, but I thought for fall it would be perfect! Now there's a jacket I'd love to get my hands on! I love it, the colours are fun and eyecatching. I like the way there are none of those colours in your skirt. You look great. Thanks Lorna! I almost missed out on this jacket, so I was so happy to get my hands on it during Zara's summer sale. Before I even looked down, I thought Zara! I love them and this jacket is very pretty on you, the colors and paired with the mulberry skirt looks just favulous.THe box handbag is a great addtion! Yes, this jacket does scream "Zara" I suppose! They have great jackets in my opinion! Thanks for stopping by Jess! This ensem is very cute; delicate in color and in shape. Thanks for joining Fashion ITEM Friday, too! Thank you Renae! I appreciate you hosting the Friday linkup. I hope you had a great weekend!